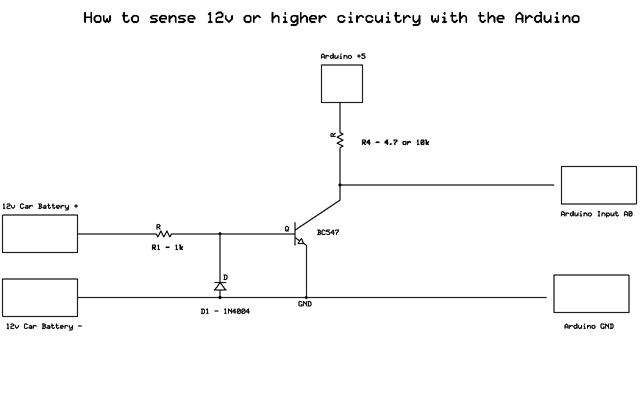 I am looking to detect 12+V from a car wire using an Arduino. 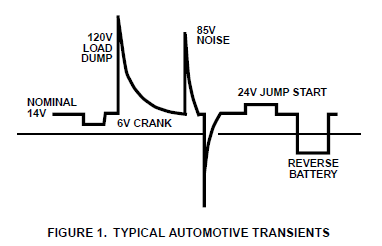 I know how crazy automotive voltage can get so I just want to make sure the schematic I found above will accommodate the crazy random currents that the car could produce. Also, wouldn't I need some type of heat sink taken that I am stepping down a +12V to 5V or less? That, in my mind, would produce a pretty good amount of heat? Knowing that all sorts of weird stuff can happen in automotive power circuits, and not being especially knowledgeable in those systems, I'd err on the side of caution and use an opto-isolator. 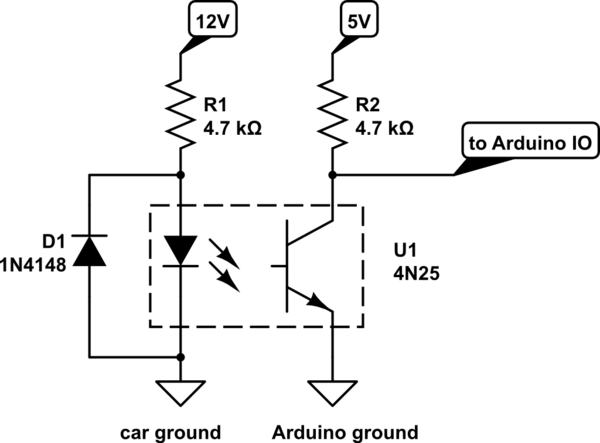 With this scheme, your Arduino and the car aren't connected electrically at all. At worst, the optoisolator is destroyed, and you can replace it for less than a dollar. Put it in a socket and you won't even need a soldering iron to perform the repair. R1 was selected such that input voltage transients up to 120V won't exceed the maximum forward current of U1. D1 avoids exceeding the maximum reverse voltage of U1 if the input voltage is inverted. The value of R2 isn't especially critical, so it might as well be the same value as R1. So, the voltage itself doesn't make heat: it also depends on how much current is flowing. In both these circuits, the current is low enough that the power is small and no heatsink is required. You are on the right track, never hurts to have the reverse diode in there although you can belt-and-braces it by sticking an 18-22v Zener in its place. Be aware that the voltage of the car may be higher than 12V, but at the lead-battery it should not exceed 13.8V for charging reasons. I have used this for detecting a 12V circuit. You can also try to use this to detect charging levels of the battery if you connect it to an Analog input. Not the answer you're looking for? Browse other questions tagged arduino current resistors automotive 12v or ask your own question. Will I need diode if I add button to this schematic?